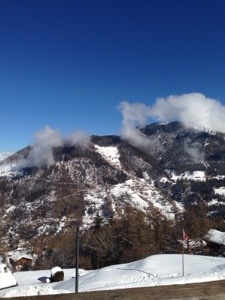 I am currently approaching the end of my first weekend away skiing. I’ve been with friends in a small ski resort called La Tzoumaz; a ten minute ski ride away from Verbier (much longer by car) and a two hour train ride from Geneva. I am sad to be leaving as I discovered I adore skiing, and was even called “a natural” by my much more experienced friends. I also learnt that I’m a speed junkie, but fell over enough to learn that I’m not good enough to fully embrace the speed quite yet. This trip I conquered blues, next trip I hope to do reds and perhaps even a little off piste..?! 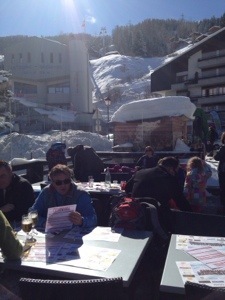 As I quickly discovered, one of the perks of skiing is the après ski food and drink. We headed to Vitho on Friday afternoon and had some great hot wine. It was very much like mulled wine, just without the extra spices. The atmosphere was great, outside was a big party for the kids’ ski school award ceremony, inside there was a live band, people aged five to seventy dancing, and great old school music. As we were lucky enough to be staying in my friend’s family’s chalet (referred to several times throughout the weekend as “the most luxurious place we’ve ever been/something out of grand designs”) we opted for cooking in the chalet and unwinding in the outdoor hot tub whilst dinner was cooking. We did however stop for lunch today at La Central which is, as the name suggests, very much in the centre of the action being bang opposite the ski pass shop and the entrance to the main gondola. We sat outside as the weather and view were both incredible. 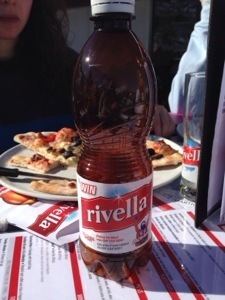 I was curious to try Rivella, a favourite drink of the region. It’s a fizzy drink made from milk syrup; I wasn’t keen at first but it did grow on me by the end. Or maybe I was just thirsty from the altitude. 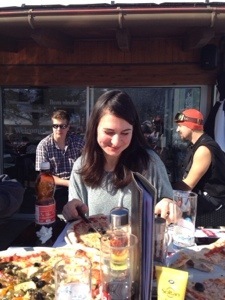 I ordered a vegetariana pizza, it was very good, just what I needed after a tough morning on the slopes. My table of four all very much enjoyed theirs also. Not only did we like La Central, clearly so did the man who arrived shortly after we did, who let out a surprisingly loud “superrrr! !” when he was told there was a table free outside. I plan to be hitting the slopes a lot more often, next time trying some Swiss mountain food, so watch out for a fondue review coming up!